It’s been a bit of a crazy week with three hospital appointments (well, technically…more on that later!) and what has felt like no real downtime, so I feel a bit like I’m running on empty at the moment. But, as always, there have been good parts in between, and those are the things I try to capture in my daily photographs. I started doing something called Project 365 a number of years ago, which is basically where you take one photo every day for a whole year. I got a bit addicted to it and have done it for so many years now that I’ve lost track of how many photos I’ve taken. But in the last year or so, I decided that instead of just taking a photo that represented the day, however rubbish, that I would look for happiness or positivity in each day, and base my photo around that. I find it just helps a bit on those days that are a real struggle, and when I look back at them it’s nice to know that there was something good even in the most difficult of days. Last Sunday was a really nice home-y day, which are definitely my favourite kind of days (even though obviously it’s fun to be doing exciting things – you just can’t beat a relaxed family day). I woke up ridiculously late, which definitely wasn’t my plan but I obviously needed the sleep! I wasn’t feeling particularly great, so just took things slowly. My brother, David, came over late morning, so I chatted with him and the rest of the family for a while, which was nice. With both of my brothers moving out and with losing three of my grandparents, it really makes you treasure time spent with family. As the weather was so good we took the dogs out in the garden to play. 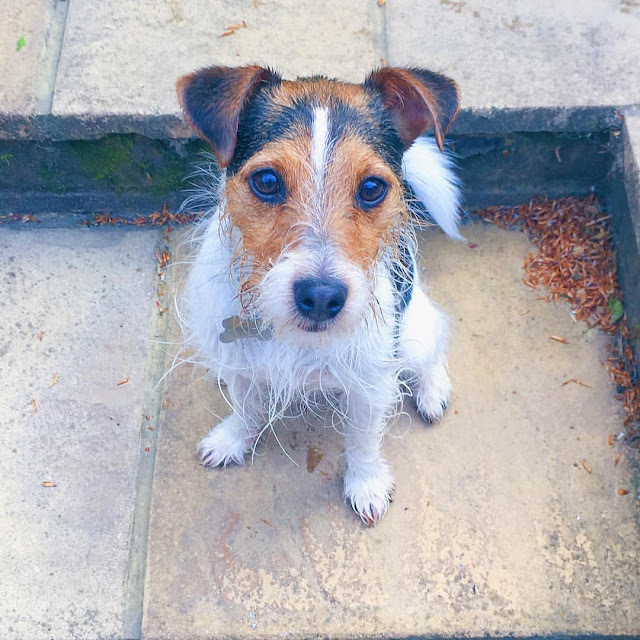 This little munchkin (Freddie) absolutely loves water, and got rather wet as we were pouring the watering can and he was just jumping around in it! I spent a lot of the afternoon trying to write a blog post, but I kept nodding off and the heat in my room didn’t help. I spent the rest of the afternoon just chilling out, flicking through a magazine and watching The Simpsons. For my Self-Care Sunday I treated myself to a DIY mini-facial, which was very relaxing. Monday brought with it a whole day without any plans, which was a nice prospect after the craziness of the last few weeks (and the fact that for the next three days I had hospital appointments looming). After a bit of a lie-in and a lot of procrastinating, I spent the morning editing a load of photos off my camera and importing some videos I filmed recently. In the afternoon I caught up on my blog emails, wrapped a birthday present for a friend and got it ready for posting. I popped to Waitrose with my Mum just to get out of the house for a few minutes. 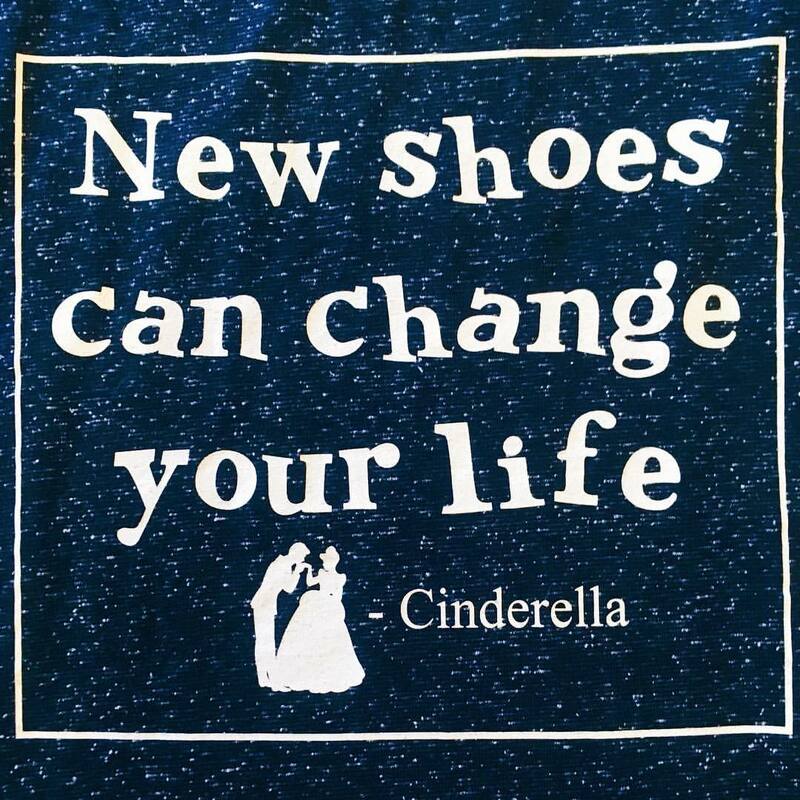 I wore this t-shirt from Primark, which makes me smile for two reasons: 1) It’s Disney and 2) It’s so true! I had a very early start (5am – ouch!) on Tuesday, which wasn’t much fun, especially considering it wasn’t for anything exciting! My Dad and I made our way to the station, got a train to Clapham Junction and then the over ground to Denmark Hill. King’s College Hospital is fairly close to the station and we got there in plenty of time, so had some breakfast in the café, which helped me wake up a bit. We then went up to the Arrhythmia Clinic and I had an ECG and my blood pressure checked, before seeing the specialist nurse. We had a chat about my POTS and the new drug (Midodrine) they’re starting me on, then she gave me my first dose. I had to wait around for a while to have my blood pressure monitored, so I read my book and finally managed to finish it! When they were happy I was safe to go, Dad and I decided to just make our way back rather than getting lunch in London, as it was pouring with rain and we were shattered. So instead, we found a little café when we got closer to home, which meant we could relax a bit. 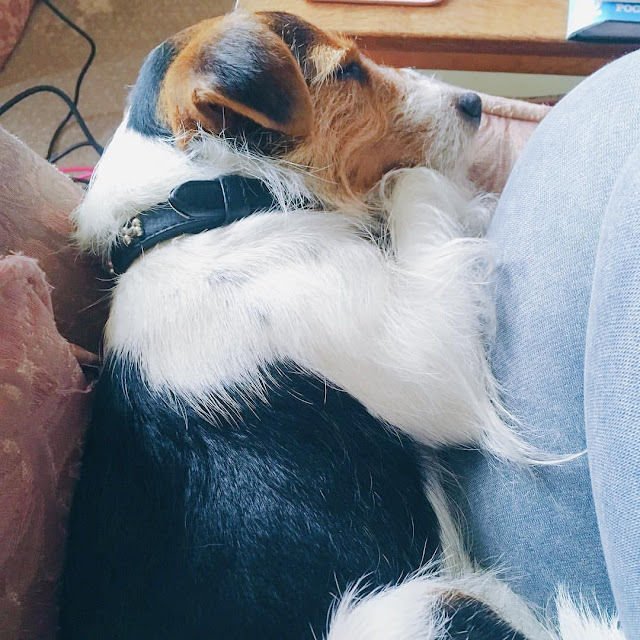 As soon as we got home I fell asleep on the sofa and spent the whole afternoon asleep, which was definitely what I needed! Wednesday was a bit of a rubbish day to be honest. I woke up not feeling brilliant, which was probably a mixture of the effects of Tuesday and the new medication. But my Dad and I had to go over to our local hospital, as I had an appointment with my Neurologist. Well, so I thought. I tried to book in with the receptionist only to be told my appointment had been cancelled back in March, but I hadn’t been told! This is the second time this has happened in the space of a few months (last time it was with my Gastro) and a referral letter for Stanmore was also never sent, which cost me even having an assessment there as they’ve currently closed their books. So, as you can imagine, both my Dad and I were not happy. The Neurologist wouldn’t see me without my notes, as he said I was too complex, which is fair enough and I’d rather have a proper consultation. We spoke to the matron and then to PALS, who advised us to make another formal complaint and they will re-open our case. So, after an hour and a half we came home and I crashed out on the sofa for quite a while with this little man. I did manage to get a couple of letters written in the afternoon, in between rests though, which is something. I had another fairly early start on Thursday, as my Dad and I had to pop to my brother’s flat and the Post Office before we went to the hospital. I had an appointment with my Pain Consultant, which went a lot better than Wednesday’s debacle! 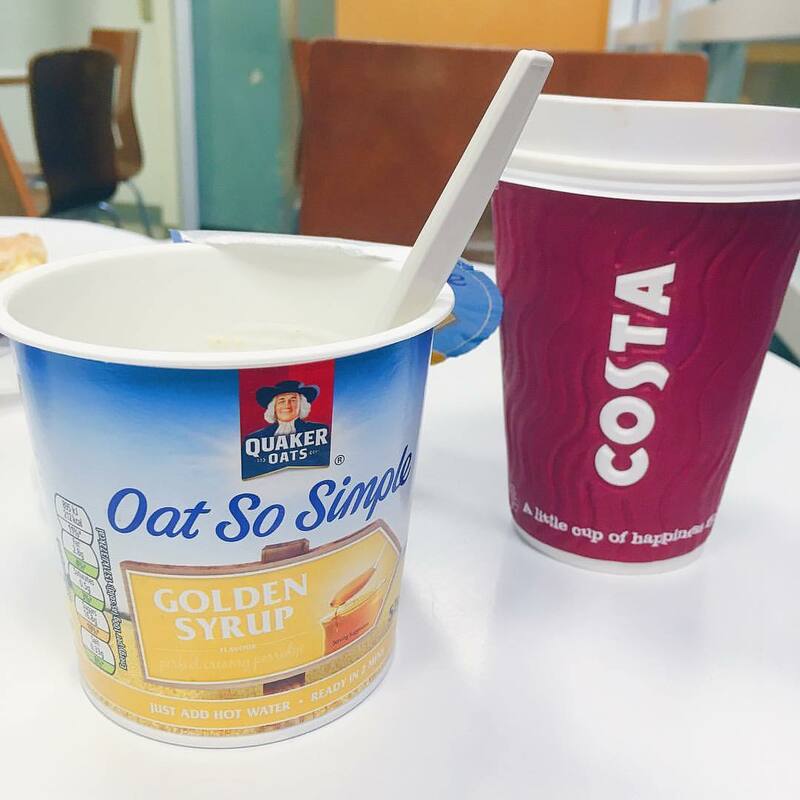 We’ve been trying to get me off opiates, but after trying numerous other things have had to admit defeat – I just hope my Gastro Professor will understand. I’m being put on Tapentadol, which I can then top up as needed with Tramadol on bad days. He’s also referred me to have injections where the base of my skull meets my spine – if those work I can have them in other places and he will also refer me to have some sort of electrical current treatment that does something to the nerve being treated. On our way home, my Dad and I popped into Costco to get a couple of bits. I spent the afternoon crashed out on the sofa, as this week had really hit me and I think the Midodrine is also making me feel a bit funny. 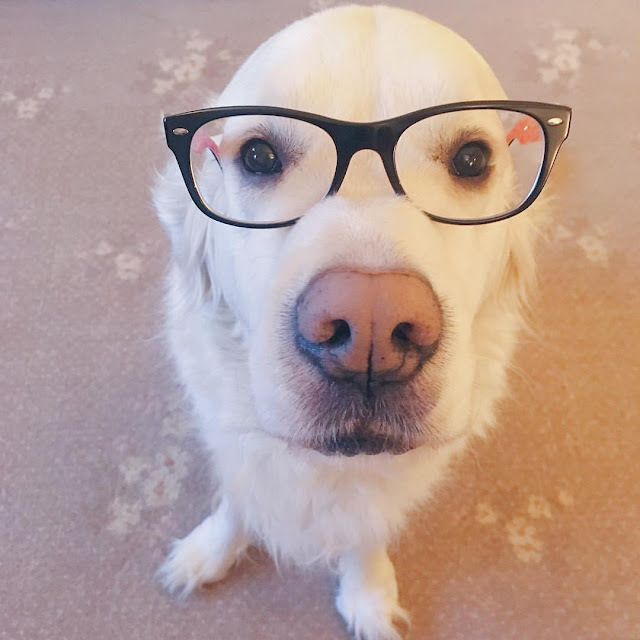 My sister, Rosiie, was making me laugh by putting my glasses on Alfie – he looks so clever! Friday was the first day in what felt like ages that I didn’t have any appointments. So, I had a much-needed lie-in and took things very slowly. I didn’t really get up and going until nearly midday, which is a bit bad but I was shattered and was feeling really dizzy. I spent a while editing and uploading an EDS Awareness video to my YouTube channel, which I’m happy I’ve actually managed to get up in May! You can watch it here and I would really appreciate any support over there. I rested for a while and watched a bit of YouTube. Then my Dad and I popped down to a local photography exhibition to have a look round for half an hour, which was nice. 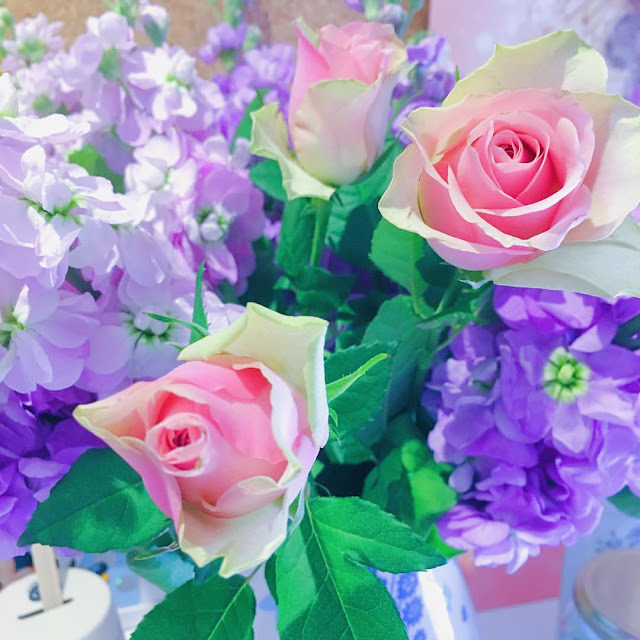 I got some new flowers for my room and they smell amazing – I’ve never bought stocks before and they went really well with these beautiful dusky pink roses. Yesterday was more of a relaxed day, and I actually had a social engagement for a change! I had a really quiet morning just pottering round the house and wrapping some birthday presents for my friend. Around lunchtime, my friend Becky picked me up and we went to the cinema to see The Jungle Book. If you’re a regular reader, you will know how much I love Disney, so I had high hopes for this adaptation of the classic film (and, of course, book by Rudyard Kipling!) Thankfully I wasn’t let down – the film was fantastic, if a little dark in places, but it stuck to the story really well and the animals looked so realistic. I will definitely be buying it on DVD when it comes out, and there are also so many other exciting films coming out over the next few months that I want to see – Finding Dory, The Secret Life of Pets, Me Before You, Mother’s Day and Alice Through the Looking Glass. After the film, we chilled out in Starbucks with one of their new fruity Frappuccino’s, before Becky’s boyfriend picked us up and dropped me off at home. I rested for a little while, and then had an unexpected visit from one of my closest friends, Sarah. I had planned to see her on Sunday, but we managed to squeeze in an extra catch-up on Saturday too, which was so lovely as we don’t get to see each other enough these days due to distance. I actually ended up watching some of Eurovision last night, which isn’t like me as I’m not really a fan, but it was quite fun to watch it with the family. If you haven’t read my blog before, I just wanted to let you know that I have a second blog, which mainly focuses on my health in more depth than I talk about it here. It’s largely for friends and family to follow and keep up with what’s going on, but if it’s something you would be interested in reading as well, you are more than welcome to follow me over there. It’s called ‘Zebra Crossing’ and you can find it by clicking here. I’m trying to keep it updated fairly regularly, so hopefully there will be something there for you to read!